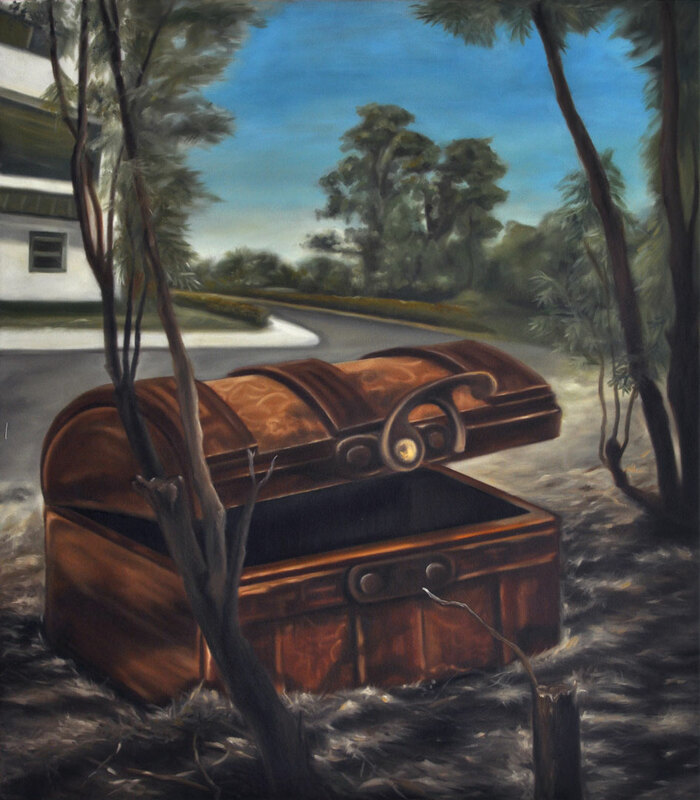 Like explorers, inventors and other stargazers, treasure hunters are driven by the thrill of discovery. In the Philippines, professional and amateur hunters still continue to roam the country in search for the Yamashita treasure, a supposedly immense cache of gold, diamonds, jewelry, and other precious items, which the Japanese general hid in several locations before his surrender to American forces during World War II. 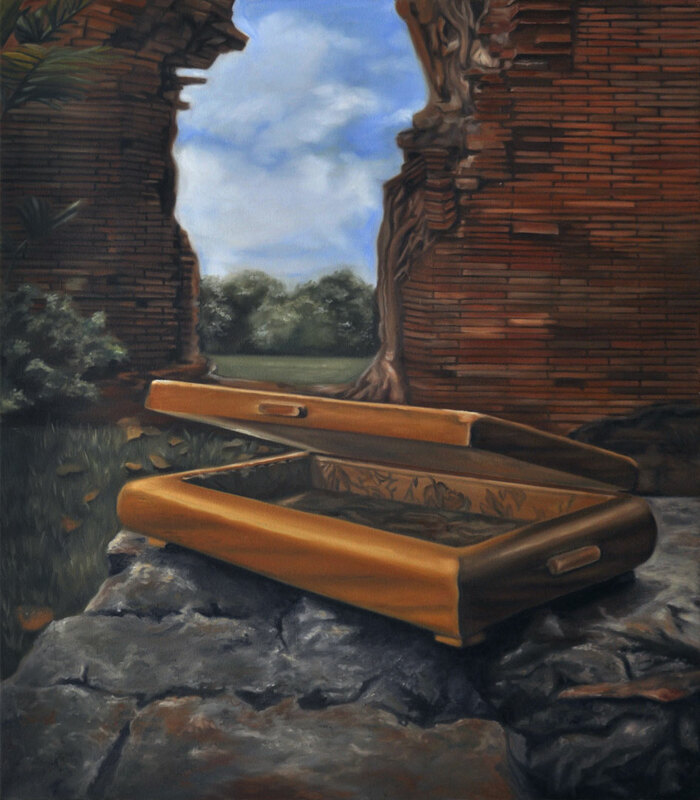 The legend of Yamashita prefigures in the imagination of many like young artist Ranelle Dial, who visited a number of treasure sites for her two-part work, Seek Keep & Hide, a series of photographic paintings of chests, drawers and boxes in specific places within Metro Manila where treasures were said to be buried or have been found. She juxtaposes the search for the Yamashita gold with a more contemporary hunt – Geocaching, an online game with players spread across the globe. Instead of gold, they look for ‘geocaches’ hidden by other players in various landmarks and iconic places and also leave their own stashes for others to find. The elements of play, puzzles, mapping, and codes runs through a number of Dial’s previous works, such as her Jenga Empire State Tower, paintings of Rubik’s cubes, people’s thoughts inscribed on their bald heads, or hand signals with multiple meanings. For this new exhibition, she offers us another round of guessing games. She prefers not to name the treasure sites, although she leaves her clues, like the titles, which are GPS coordinates. Shelves patterned after the map of Metro Manila and books containing objects, tokens, and symbolic treasures also provide further hints. 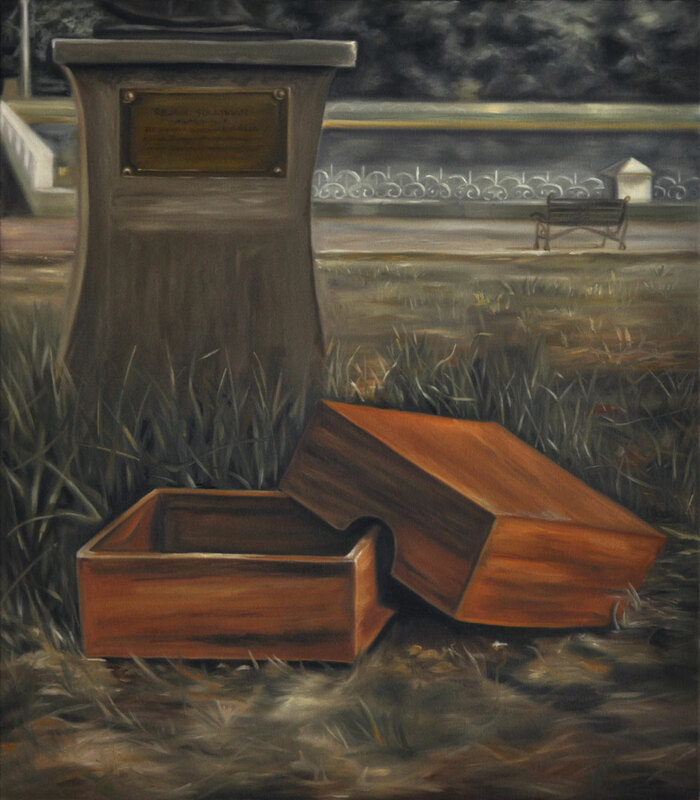 The box or the idea of a container is also a recurring subject for the artist, who is drawn to representing not their contents, but mostly their empty states. 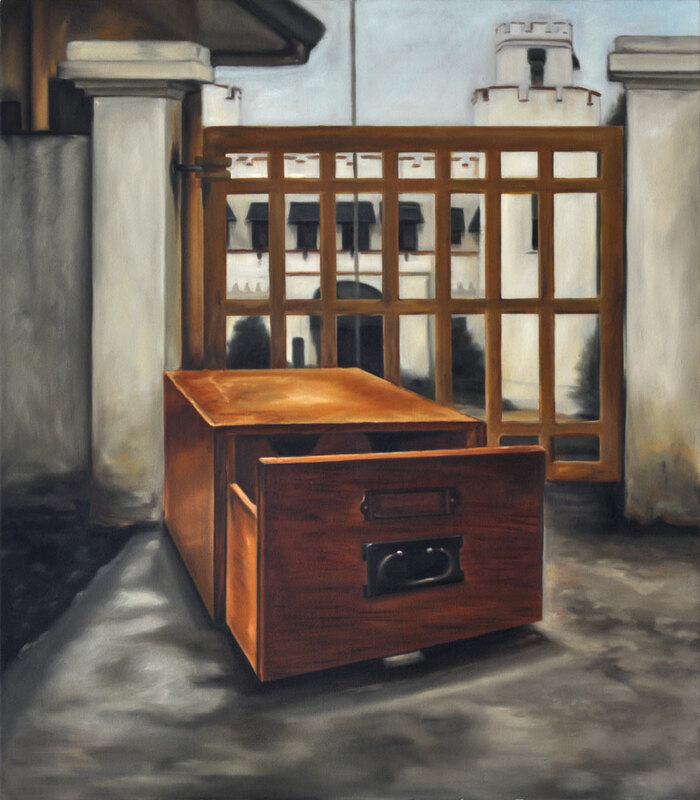 Her earlier exhibition entitled MgaSisidlan(2007) depicted empty cabinets, drawers and boxes in varying states of abandonment. The viewer is left to wander what sort of things they once contained. Situated in domestic spaces, they could have heldclothes, plates, papers, and other personal items, which were seemingly packed up by the owners in haste. 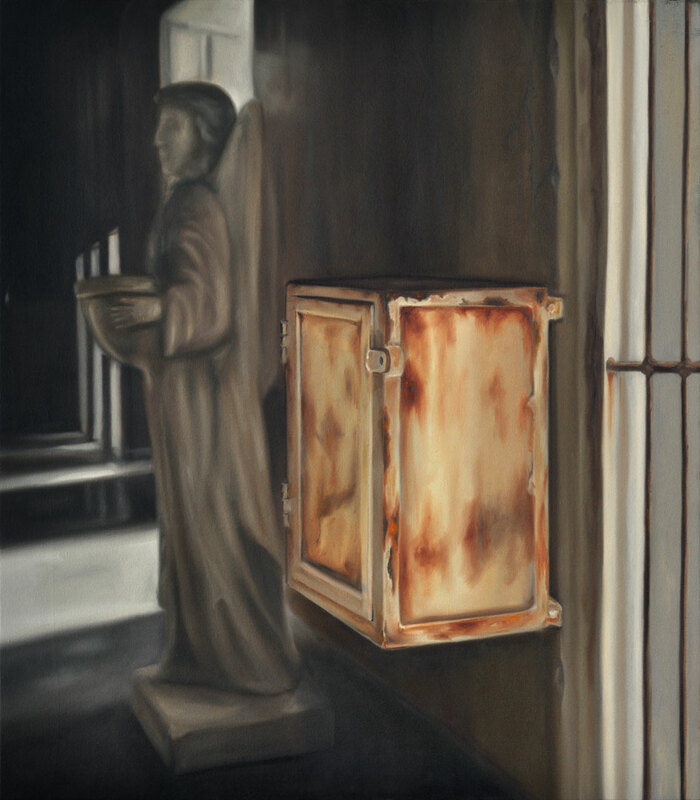 In Withering (2008), desolate paintings of mailboxes in different countries highlight the nearly lost practice of letter writing. Mailboxes have been increasingly rare, defunct and unused in today’s preference for faster communication. 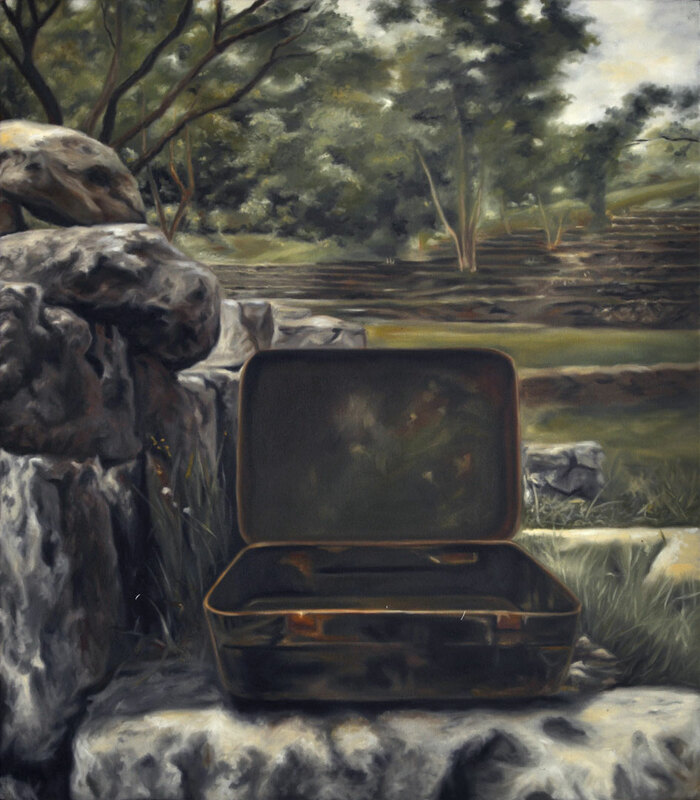 By painting them, the artist not only performs a kind of taxonomy, she also acts as a kind of conservator, preserving their images in oil. Even her annotated portraits of writers and thinkers in The Seat of the Mind (2010) and Mind – Mapped (2010), focus on the head, all shaved to further emphasize form and function, a vessel for invisible thoughts, memories, secrets, dreams, and hidden knowledge that lie within the subjects’ minds. In Seek, Keep & Hide, Dial combines representations of boxes with actual ones, creating a tension between what is real and what is imagined. 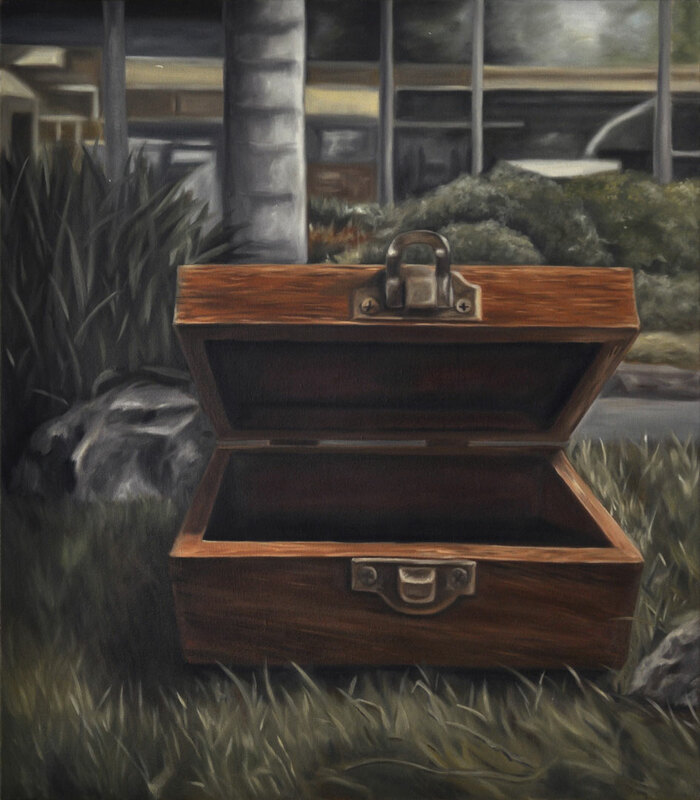 Her paintings, executed, almost like polished yet dated photographs, with fading and shadowed colors, investigate the indexical qualities of images and stand next to modified books that contain real found objects. Her cut – out, map-shaped shelves made out of compressed layers and layers of plywood have a looming solidity, rawness and presence. Her intentionally mixed classification and presentation of sites reveal a certain idiosyncrasy that serves to foil the seekers from easily locating the buried treasures. Like the Yamashita treasure, and other pots of gold hidden somewhere in the earth if not at the end of rainbows, we do not even know for sure if they are true. Memory can be quite like a hoax. Like some fabled treasure hunts that only lead to further traps, dead-ends and bogus trips, the act of remembering can be a circuitous process that offers no guarantees of absolute truths and revelations. In Ranelle Dial’s Seek, Keep & Hide, each trace or clue left behind adds a guise to a constructed fiction spun from fragments of reality, desire and perception. While engaging viewers to a challenge of naming sites and actual locations, they additionally reinforce the allure of secrecy, the unknown and myths.